This is a great find of the year 2008. This pen is a very early Parker N°15. The cap is gold plated filigree. This is the first version of the cap with a round and black top. The barrel is made of abalone with a nice corrugated design. The cap is nicely engraved (see picture). 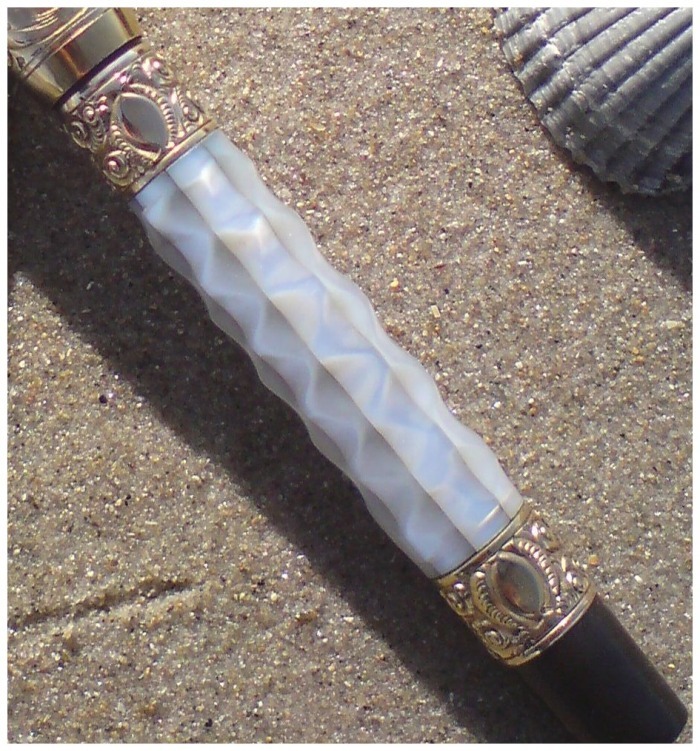 The Parker "30" is an eyedropper filler, gold plated, with a diamond and snail overlay. 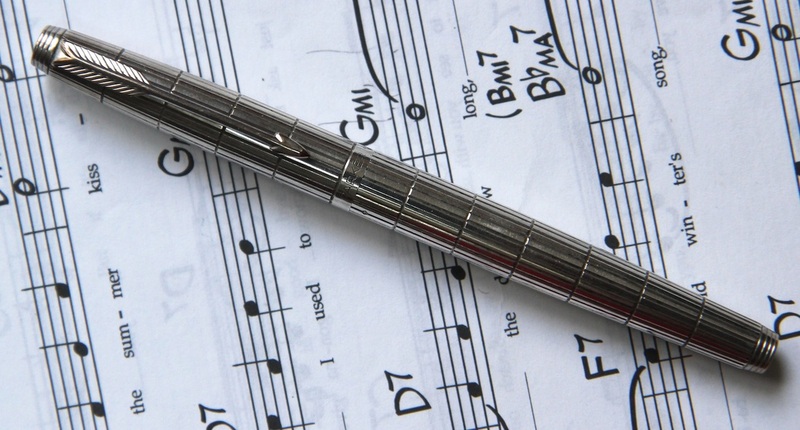 The pen has the lucky curve feed. It is a very early Parker with no engraving. I have been looking for this pen for a long long time. I wanted one in nice condition. Last year, good chance ! ... on Parker 42 1/2 with an interesting buy it now price. 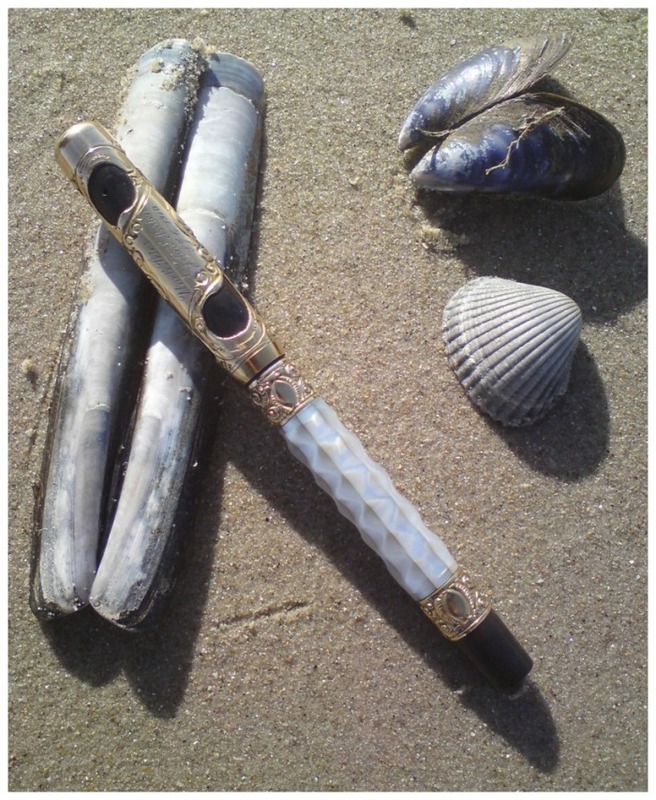 I buy the pen at an american seller, pay immediatly ... and never received it !!! Several months later i have found this one in beautiful condition, with a nice chasing. This one is an eyedropper but the 42 1/2 also exists in button filler. 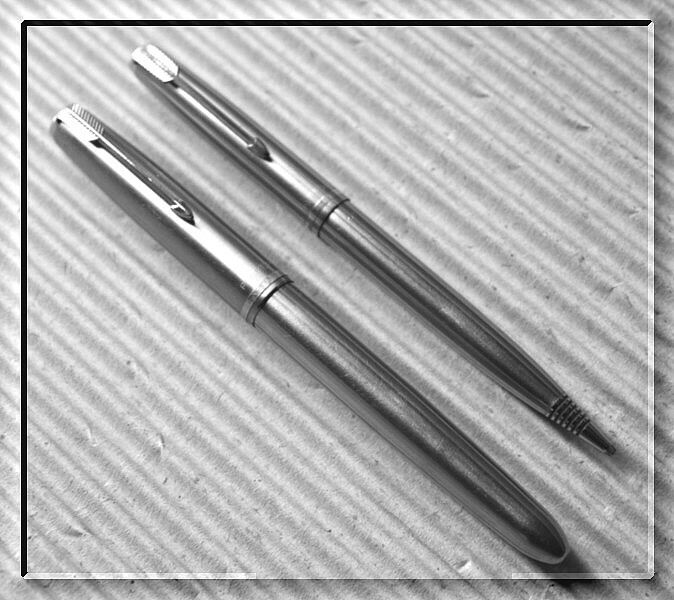 These two oversize fountain pens are from the 1920's These pens are difficult to find with no discoloration. 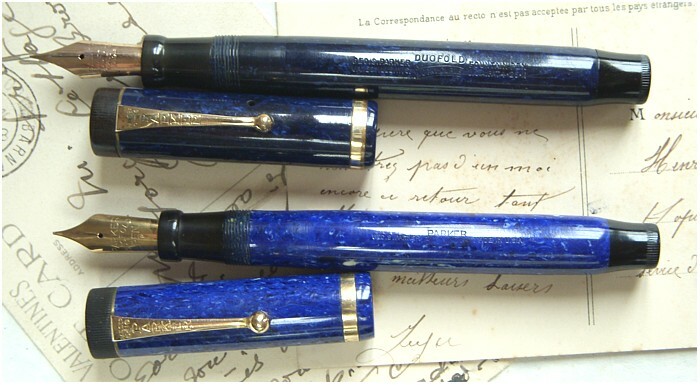 The Lapis blue (on the bottom) is very often dark blue and is not so bright and shiny as this one. 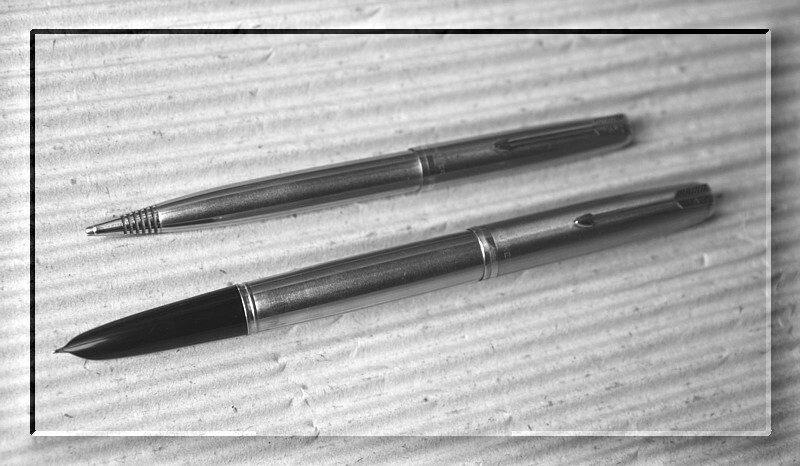 These two pen have more than 60 years difference. On the bottom the famous Duofold Big Red of the 1920's with one ring and its lucky curve feed. On the top, the reedition of the 1990's, Duofold Centenial. 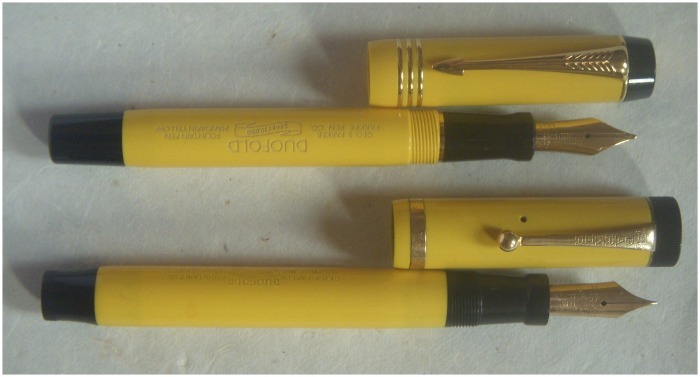 This is the yellow version of the Parker Duofold. Senior size. This model is difficult to find in good condition as the material is very fragile. Most of the Mandarin have a crack or two at the cap lip, which clearly decrease the value of the pen. The yellow color can also be discolored, tarnished. This one is in near mint condition. The Junior size version was used by the famous writer Colette. This color was less sold than the others and this also explains why this pen is quite rare today. French writer Colette's hand holding her Parker Duofold Mandarin ... and her cat. 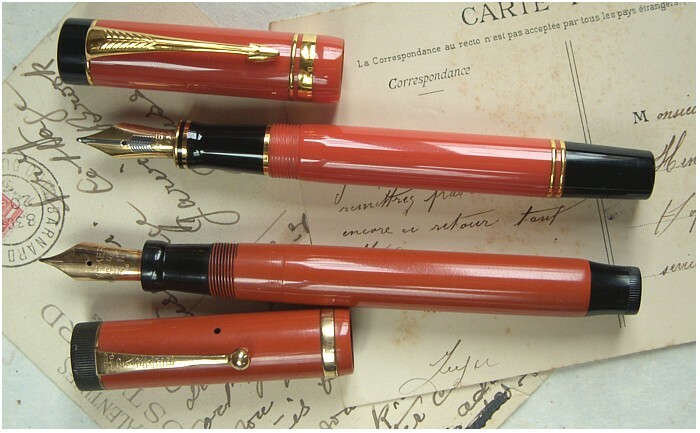 A new version of the Duofold Mandarin has been produced in 1995 as a limited edition of 10000. The design of the modern version is in fact inspired of the mandarin of the 1930's, in the "streamlined" version. This is a nice set of the 1920's in the original box (damaged). The black duofold exists in hard rubber for the earlier version, with one cap ring, or in plastic in the later version, with one or two cap rings. 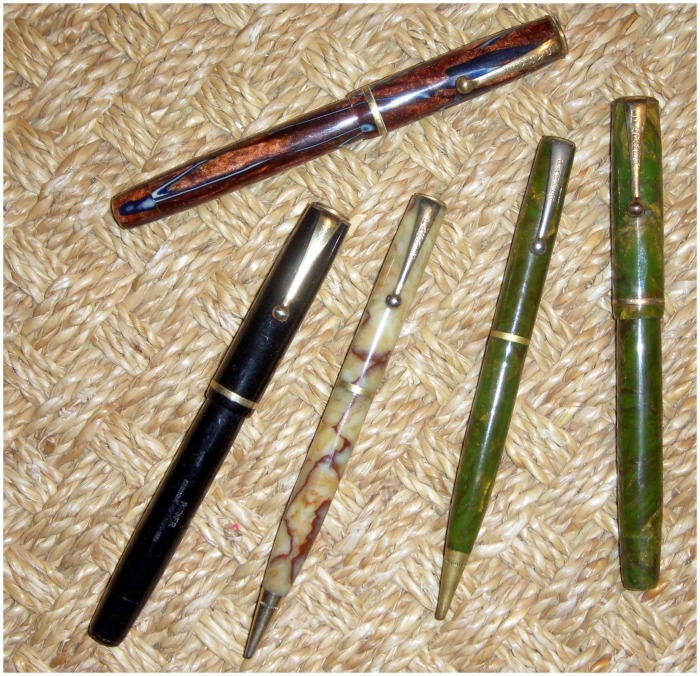 These pens, also called Depression Era Pens, were made during the 1929 crises. 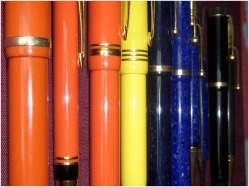 These are small pens but the material and colors used are actually very nice. There are four different colors on this picture (green and bronze, onyx, black, blue and bronze) but many others exist. This is a good idea of collection as there are many very nice colors and the value of this model is not very high, except for some rare colors. 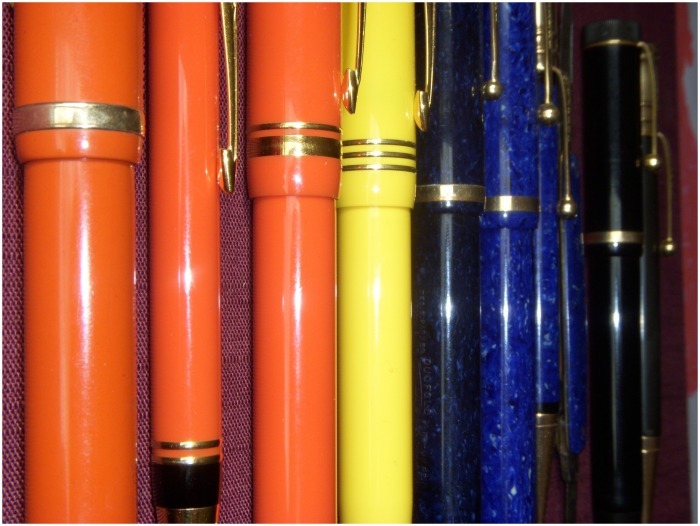 The fountain pen is a button filler, easy to use and repair. 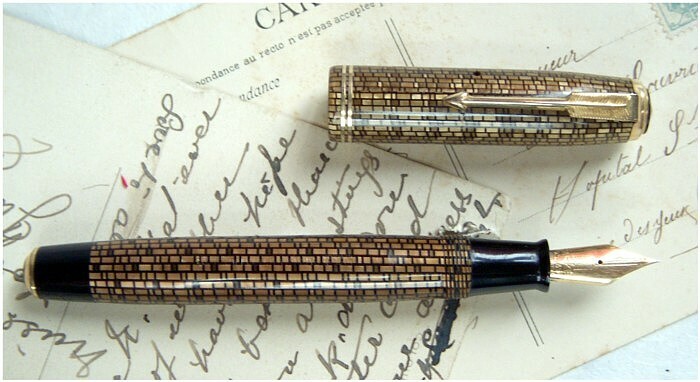 The Parker Vacumatic was created in 1933. The famous Parker Arrow appears with the vacumatic, on the clip and nib. Most Vacumatic are striated like the "Maxima", here after. The Golden Web was produced in 1936 with this specific color and patern. This is the green version of the Maxima, the biggest Parker Vacumatic. The transparency of the vacumatic material allow to check the level on ink. Note the striated section and the nice two tones nib. A great writer. This is the very famous Parker 51 which was launch in the 51st year of Parker. This pen exists in an extremely wide range of finitions and colors. Some are easy to find, some are quite rare and expensive. 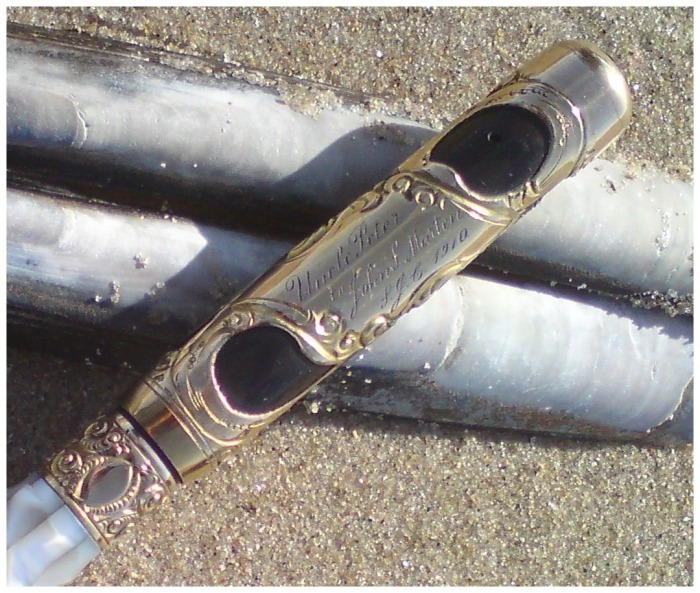 This one is the "Flighter" with stainless steel cap and barrel ... the one i prefere. The specificity of the Parker 51 is this section which covers the small nib. This version is a single jewel (on the top of the cap). Other versions were made with two jewels, one on the cap and one on the barrel extremity. The filling system on this version is called "Aerometric". A sac is in a cage and has to be pressed several times to fill the pen. 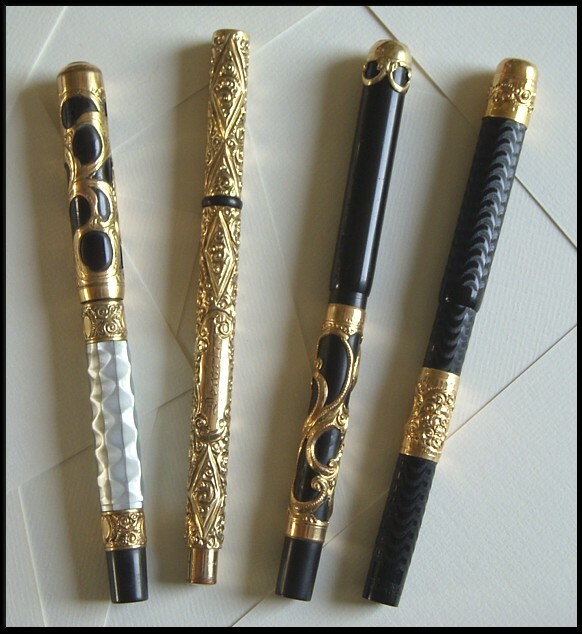 If you are looking for a vintage pen, easy to use, reliable, this could be your man ... if you don't hate this nib design. The "75" is a success story for Parker. This model was launched in 1964 for the 75th anniversary of Parker and was produced until 1994. Many patterns were produced and the most common version in sterling silver is the "cross-hatched". The two models below are more difficult to find and were made in France. These are the "Godron" and "Damier" patterns.